And somewhere in there, we found time to buy a new car. Well, not new … better than new! 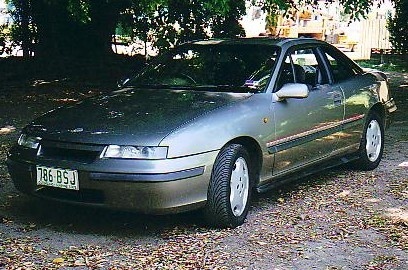 A 1992 European classic, a calibra, built in Germany and brought into Australia between 1991 and 1996 as a Holden. It’s a trip down memory lane for me, as you’ll see by the photos below. 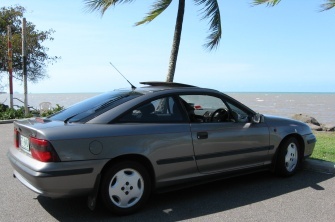 The car on the left is the Calibra I bought in 1999 and sold before my last round-the-world trip in 2003. 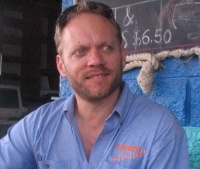 The pic on the right was taken last week at MACHANS BEACH, right here in Cairns. This one needs a bit of work, and it will be some time before it is back to its former glory. But we’ll get there. This entry was posted on Wednesday, October 31st, 2007 at 10:42 am	and is filed under At home in Cairns. You can follow any responses to this entry through the RSS 2.0 feed. You can leave a response, or trackback from your own site.